First-term Republican Congressman Jesse Young, who represents the 26th District in the Washington State Senate, is attracting significant attention for an unusual detail in his transportation budget: he’s included $90,000 to conduct a feasibility study into building a massive floating bridge from decommissioned aircraft carriers. The bridge, Young proposes, would span the Sinclair Inlet and connect two of the towns he represents, repurposing old military equipment to create new infrastructure and a distinctive tourist attraction. But, alas, the proposal does have one or two issues that suggest it may be rather less than… feasible. Congressman Young’s entirely serious plan is to connect the municipalities of Bremerton and Port Orchard—which are an hour-long ferry ride west of Seattle—across the Sinclair Inlet with decommissioned aircraft carriers. These carriers could, Young suggests, be connected and transformed into a toll road that would more efficiently connect the two small towns. To that end, he has a point. It would certainly draw attention (the proposal already has), and some of that attention would invariably involve military tribute. And aircraft carriers do have a limited lifespan. The two carriers Young has his sights on are the USS Kitty Hawk and the USS Independence—the Independence was launched in 1958, decommissioned in 2004 and is set to be scrapped later this year. The Kitty Hawk is a slightly different issue; it was launched in 1960, decommissioned in 2009 and is currently in reserve until its replacement is commissioned. To undertake such a project, naval cooperation would be of foremost importance. But, typically aircraft carriers are scrapped or turned into museums—so far the Navy has no apparent interest in repurposing old craft for use as municipal infrastructure. Indeed, there is already some interest in turning the Kitty Hawk, once it is taken out of reserve, into a museum. Then there’s the other feasibility issue—the very concept of floating bridges. As Wired points out, these carriers are “easily 1,000 feet long and rising 200 feet out of the water” and form what is ostensibly a massive sail. To keep multiple carriers in place as a bridge, one would need extraordinarily large anchors—doable, yes—but equally extraordinarily expensive. In addition to structural and engineering issues, there are also some environmental concerns. Dr. Anil Kumar Agrawal, a professor of civil engineering at City College of the City University of New York explained to Wired that while engineering issues could, perhaps, eventually be resolved, there would remain concerns as to how the massive carriers, wedged in a small body of water might alter the movement of marine life in the area. Young’s budget proviso stipulated that a “report on the study must be submitted to the transportation committees of the legislature by December 1, 2015,” which will, we hope, provide answers to some of these engineering, environmental and budgetary questions. 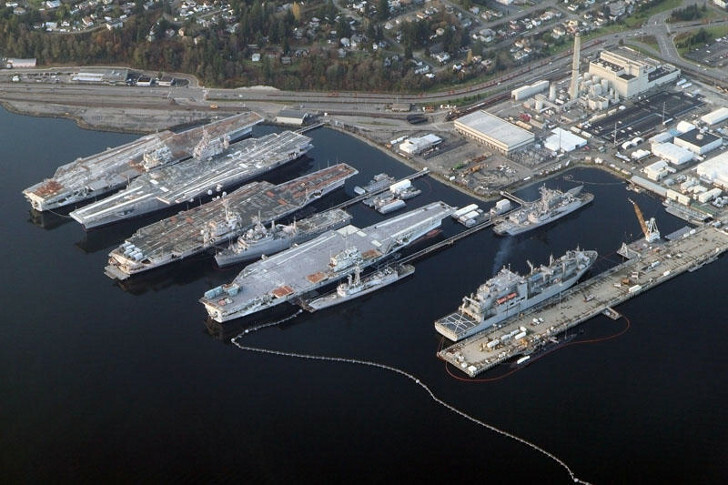 An aerial photos shows the USS Independence and the USS Kitty Hawk at the Bremerton Shipping Yard, near the proposed location of the bridge. 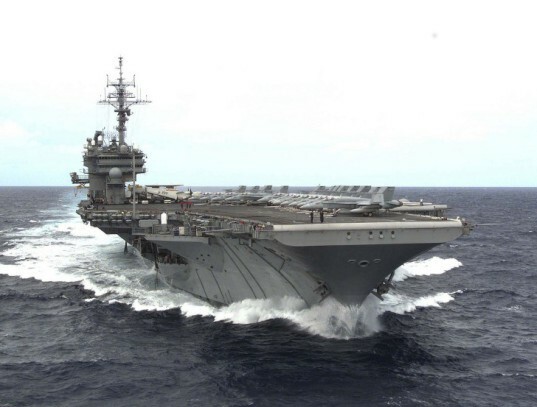 The proposal seeks to use the USS Kitty Hawk, shown here, as part of the new bridge.